I am someone who tends to forget things – a lot. That’s why I keep my trusty bullet journal. With it, I’m able to keep track of all the information my brain simply can’t hold onto. I still am guilty of mentally noting something and then losing that note forever. I am especially guilty of this when it comes to TV shows. Really, it’s any kind of entertainment. I will see a movie preview or hear a book recommendation and say “I should watch/read that!” And then I instantly forget it. 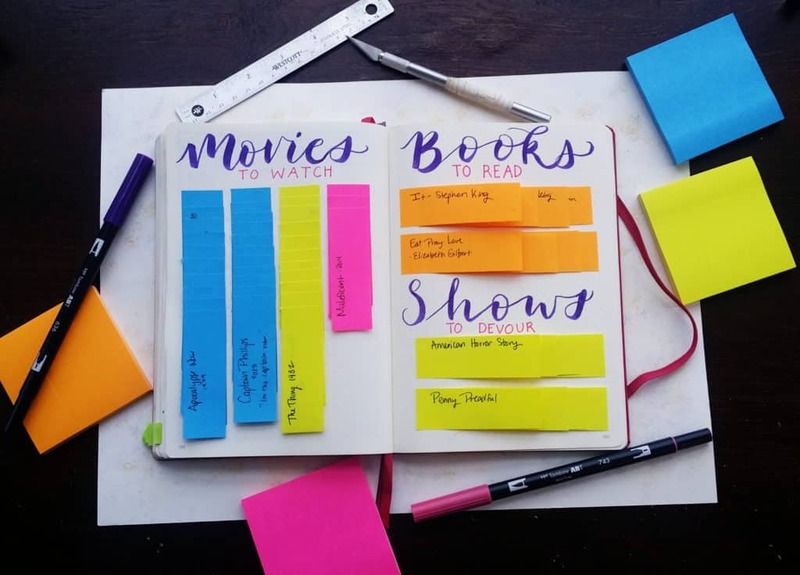 That’s why I decided to finally create my book/movie/show tracker. This is not a particularly new concept. Lots of bullet journalers have a show tracker, but having it plainly listed out just wasn’t working for me. I wrote one ages ago in my old bullet journal, but it just didn’t serve its purpose. Since I had such success with my meal planner from a few weeks ago, I decided to try that technique with a different theme. My meal planner was intended for a similar purpose: remind me of alternatives so I can cook a wide variety of meals. I am woefully behind on both books and movies in my life. My TV show game is on point, but I can’t get enough! When I get to the end of a show, I waffle for several weeks before finally deciding what to devote myself to next. With books, I’ll just wait and wait until months have rolled by before I finally get around to it. And as for movies… well, let’s just say I have watched a handful of movies several times instead of branching out and trying something new. It’s so annoying to be indecisive and uncommitted. That’s why I need this tracker in my life! 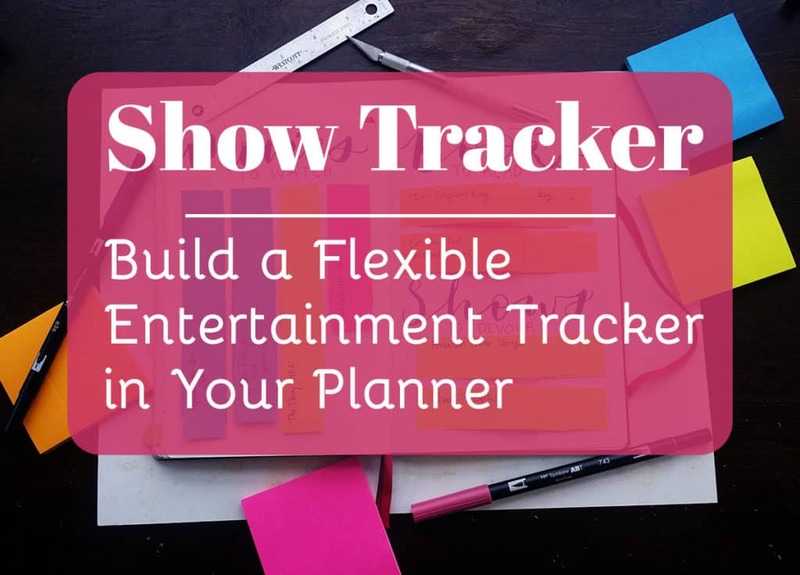 I created three categories in my show tracker spread. There’s movies, shows, and books. I wrote out each header with my Tombow Dual Brush Pens. I originally thought about using little Post It Note Flags, but I was afraid they were too small. 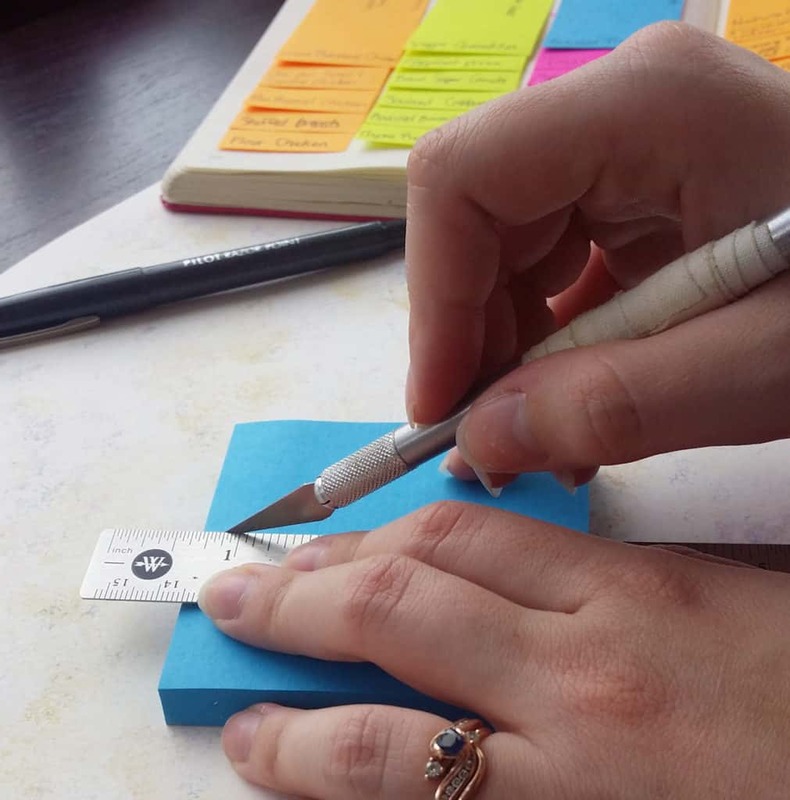 Instead, I took my standard 3″x3″ Post Its and cut them into thirds with the help of my Xacto knife and handy Westcott metal ruler. After that, it was simply a matter of writing down my list and sticking them in my bullet journal. In my movies category, I’ve gone ahead and roughly categorized my entries into three subcategories for genre: drama, horror, and family friendly. I’m not so big into comedies, so it didn’t get its own category. I just throw them in with family friendly, along with animated movies or anything else that doesn’t quite fit. On each little flag, I write the title, year, and a little bit about the movie to help jog my memory. I tried to note the movies I could find on Amazon Video or Netflix so I know I can watch them. Since I don’t have cable, I like knowing that I can still get individual channels on Amazon like HBO and Showtime so I don’t miss out on hot new shows. As for books and TV shows, I didn’t try to categorize them. I have few enough on there that I can usually remember what each one is about, so no worries for me. I think one of the reasons I dislike writing everything down on the page is that it’s just too static. I want to be able to manipulate my list a little bit without crossing things out or erasing them. With the Post It’s, I can just pull the flag out when I’ve read the book or seen the movie. I also like the anonymity of the list entries. If I am in a mood where I can’t decide what movie to watch, I can go to a genre and pick one at random without seeing the title. Then the decision is made for me and we can settle in with some popcorn. Sometimes I’m just so darn indecisive. Having a random option is absolutely perfect for me. Lastly, I can rest assured that I won’t have to write out a brand new list in a few months when I move to a new Leuchtturm. I can simply pop out the sticky notes and transfer them into my new bullet journal. What a joy! 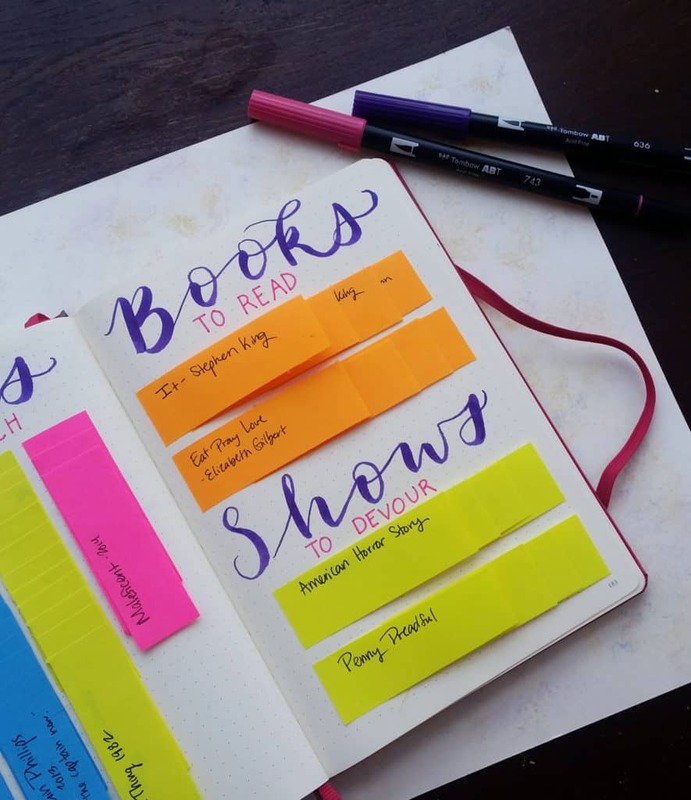 This tracker is especially great for books. I have a whole list of helpful books that I’m still getting through. But I need some fun fiction novels to read, too! I don’t like to read more than one book at a time, so I often waffle about which book to read next. Even though it’s so easy to read on my Kindle, I still hesitate. Thankfully, it’s a little bit easier with Audible. I have a few options that I definitely want to listen to. If you’ve never had the chance to listen to an audio book, try it free for 30 days and get two free audio books! It’s really neat to be able to draw or clean while listening to a book. One thing I have been dying to get is the Kindle Unlimited service. You get access to 1 million titles and thousands of audio books, among other things, for only $9.99 per month. I’ve tried their month-long free trial and loved it! Now I just need to take the plunge and sink into a sea of good reading. If you don’t have a digital reader and don’t want to buy one, you can make any device into an e-reader for free! Kindle Reader can be downloaded onto your phone, tablet, or computer for a better digital reading experience. That way you don’t have any excuse for not getting to that cool book on your list. I think this method is super easy and will make my entertainment selections much more streamlined in the future. I hate wasting time, and I want to enjoy my media without hesitation. I shouldn’t have to flounder when I am feeling like watching a horror movie (which is a lot more lately thanks to Halloween being right around the corner!). Now I can rest assured that I’ve got some options available. I don’t need to try to use any more brain power remembering that one show that I’ve been meaning to watch. My show tracker is like my own personal list heaven. Okay, I know this isn’t what this post is about, but I think you may have just solved my to-do list backlog issue. I’ve been musing for days on how to best deal with those big, hulking tasks (things like “declutter the flat”). I know they need to be broken down into sub-tasks, but I often don’t think of all the sub-tasks when I first write it down on my master list. 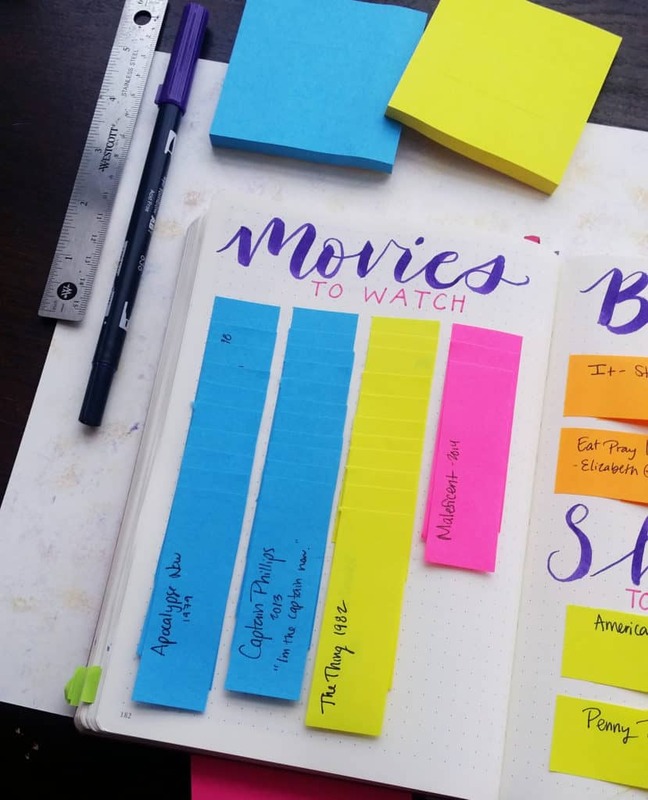 I’ve tried two different master lists (one of which involved a complicated indexing system) and incorporating Trello and the bujo lists got messy while the Trello just didn’t work with my bujo planning routine. And then I found this post and as I was reading something clicked. Post-its! I can create a Backlog spread and separate it into broad categories, then add all the sub-tasks on Post-it flags, so it’s easy to keep related tasks together. I’m going to plitter about with this this weekend so we’ll see how it goes, but thank you so much for the idea! I’m so glad this post provided that missing link! It’s funny how it sort of pops out of nowhere, isn’t it? 😀 You should totally post your resulting list on my Facebook page so I can see what you come up with! Good luck!